We are excited to announce the much anticipated redesign of the new Daptone Records Super Soul Super Store. The website completion comes just in time for the Charles Bradley pre-order of his new album “Victim of Love“, which is officially released April 2. In addition to recording artist information, news and tour dates the Daptone Records website offers Digital Music Downloads, CD’s, Vinyl LPs, T-shirts directly from Daptone. 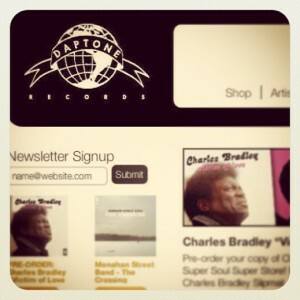 Check out the Daptone Records Website!